This is a sponsored post. Recently I received a free bottle of 100% Pure Cold Pressed Antarctic Krill Oil by Everest Nutrition to review and giveaway. What perfect timing as I just started a sugar detox and a wonderful workout plan that I find out that Krill Oil is necessary for my system. And, it will keep me looking and feeling healthy. I used to take fish oil , but now I am a loyal Krill oil fan! Have you ever heard of Krill Oil? I hadn't until I tried it, and it is amazing. I can already notice good things happening in my system. Want to know more about this oil? Here are some deets from the Dr Oz website: "krill oil has emerged as the next leader in the wonderful world of omega-3s. Just like fish oil, krill oil contains long-chain polyunsaturated fatty acids of the omega-3 family, EPA and DHA. In contrast to fish oil, EPA and DHA from krill oil come attached to phospholipids, mostly phosphatidylcholine. That structural difference leads to better absorption and delivery of DHA to the brain (in animal models). 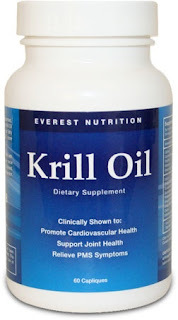 In addition, krill oil contains a potent carotenoid antioxidant, astaxanthin, that may prevent EPA and DHA oxidation. " Phew!! They play a critical role in cognitive brain function and memory. open to 18 plus, in USA only. **This information is not to be construed as medical advice. Consult a physician before using using any vitamins or supplements. Eat a high fiber low fat diet. I get my dietary fat from olive oil which is healthier than butter. For vitamin C, I eat plenty of fruit. Exercise? Push ups, sit ups, and hatha yoga. Hope to win, as I have yet to try krill oil. I try not to be too lazy - I always take the stairs instead of the elevator, I do lunges and other exercises while I'm brushing my teeth and I use my time in the car to practice strengthening my muscles. I eat a vegetarian diet to stay healthy. I eat lots of fruits and veggies and walk to work. I go to the gym but I don't do enough.. I try to eat healthy and exercise as much as I can. Well I just started to eat healthier and exercising. 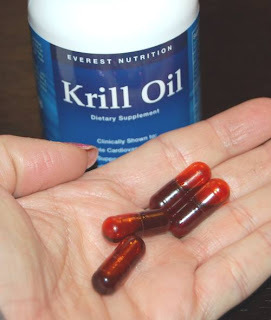 I LOVE KRILL OIL, THEY'RE REALLY HAVE A GREAT BENEFITS TO YOUR HEALTH, I'VE BEEN TAKING KRILL FOR ABOUT 3 MONTHS NOW AND I LOVE IT. I follow a vegetarian diet.